Meanwhile, only Congressman Alan Grayson was allowed to view what "progress" has been made, but was not allowed to copy, make notes, or discuss what he saw. Now one might ask, "If this is for the good of the United States, why can't we have knowledge of what is in it?" All we can go by is the results of NAFTA and CAFTA which have done little good for our nation or for the other nations involved. As Ross Perot, presidential candidate prior to the signing of NAFTA, said it would creat a "swooshing sound" of jobs leaving our country. The Corporate Media Propagandists portrayed Perot as a "madman", doing what they do best in demonizing those they are paid to destroy. As it turned out Perot was most accurate. We not only lost our manufacturing jobs, but Mexico citizens also saw the loss of their family farms which had been their livelihood, causing them to move to cities in search of jobs. Most were not able to do so which caused them to come to the United States where they took any job they could find, working for low wages and in some cases for nothing as when pay day came around some employers would threaten to turn them in to immigration services so they disappeared, unpaid, rather than being deported. Of course, nothing was done to employers who hired these individuals who were not eligible to work in the U.S. even though there were laws that could imprison employers for hiring these individuals. There have also been instances where existing laws were by-passed in favor of what a corporation wanted to do. Should a local government protest, the case would go before a mediator that was hired by the corporation. Below are some examples of the effects the TPP would have. Bear in mind the entire document covers 29 chapters, but only Five (5) actually deal with trade. That in itself ought to alert all of us! Buy American/Buy Local The TPP's procurement chapter would require that all firms operating in any signatory country be provided equal access as domestic firms to U.S. government procurement contracts over a certain dollar threshold. The United States would agree to waive "Buy American" and "Buy Local" procurement policies for all such foreign firms, eliminating an important policy tool to use U.S. tax dollars for U.S. job creation. Endangers Access to Affordable Medicines Proposes measures that restrict access to affordable medicines that have not been seen before inpast "free trade" agreements. Financial Regulations The TPP would provide big banks with a backdoor means of rolling back efforts to re-regulate Wall Street in the wake of the global economic crisis. GOP Letter to President Obama Not willing to cede Fast Track authority to Obama. Internet Freedom Under this TPP proposal, Internet Service Providers could be required to "police" user activity (i.e. police YOU), take down internet content, and cut people off from internet access for common user-generated content. Off-Shoring U.S. Jobs Nearly five million American manufacturing jobs – one out of every four – have been lost since implementation of the North American Free Trade Agreement (NAFTA) and the World Trade Organization (WTO). Since NAFTA, over 60,000 American manufacturing facilities have closed. The TPP would replicate and expand on the NAFTA model. TPP & Corporate Power Trade attorneys/officials have been writing the things needed for corporations to supercede the soveriegn rights of nations. TPP & Democracy The TPP is not just one of the biggest “trade” deals in U.S. history, but also one of the most secretive. After more than three years of negotiations under the Obama administration and despite a plan for the deal to be signed by the end of 2013, the press and public are still being denied access to the draft TPP text that, if enacted, would impact our daily lives. 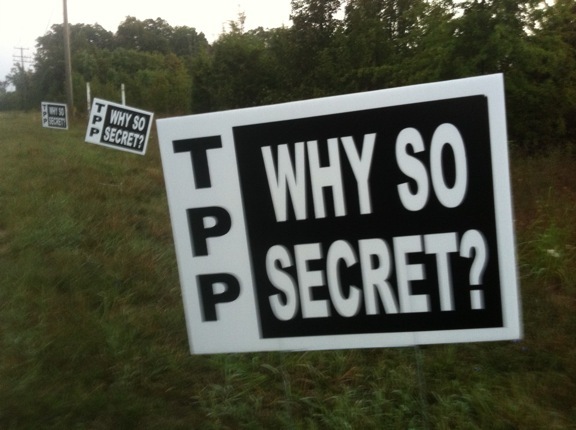 The TPP’s secrecy threatens basic democratic principles. Even our representatives in Congress – elected as caretakers of the domestic policies that the TPP would rewrite – have been denied access to the TPP text for years. Only recently have they been allowed to see select chapters, unaccompanied by staff, and under the condition that they not share what they read with the rest of us. TPP & Public Health The TPP would provide large pharmaceutical firms with new rights and powers to increase medicine prices and limit consumers' access to cheaper generic drugs. TPP & the Impact on the Environment TPP will threaten the environment and nations and/or local communities will have no say. TPP and the Environment Fact Sheet Corporations will be able to do whatever they want as nation's sovereign rights will be relinguished. TPP Would Undermine Most Public Services The TPP would include rules limiting how governments may regulate the service sector - utilities, transportation, education and more. Use This Script When Calling Your Representative To GOP - You have stopped Obama in the past - DON'T STOP NOW! To Dems - It's time to stand behind your consituents and the hell with the campaign dollars from corporate lobbyists. Workers' Rights By making it easier for U.S. corporations to offshore decent jobs to low-wage countries, the TPP would accelerate the "race to the bottom" spurred by other free trade agreements, such as the North American Free Trade Agreement (NAFTA), putting downward wage pressure on U.S. workers while facilitating corporate exploitation of foreign workers. TPP includes the same incentives and protections for off-shoring as NAFTA, such as special investor rights that eliminate many of the risks and costs associated with relocating jobs to low-wage countries.